It’s Friday, and if you are anything like me, (or you know, breathing) your thoughts turn towards the weekend. Are you planning on spending time at the beach? In the garden? Catching a movie? Sleeping for 14 hours straight? For me, Fridays always bring thoughts of what I’m planning to cook this weekend. Weeknights are rushed and hurried – trying to get the Nuni to bed (which is always accompanied with the command, “Sing songs!”), trying to get dinner on the table and then collapsing from exhaustion – but weekends are my cooking time, when I can try new recipes and make things that aren’t strictly necessary, like this panna cotta. I know that Panna Cotta is the new crème brulee – featured on every restaurant menu, in various guises. It feels a little trendy, a little of the moment. But really it’s classic in its simplicity — just sweetened milk or cream that’s thickened with gelatin. If the term “panna cotta” intimidates you, just think of it as “milk pudding.” Or make this one that’s flavored with toasted almonds and call it blancmange, which evokes that delightful Edith Wharton/Louisa May Alcott feel. The basic method for panna cotta is to dissolve sugar in heavy cream, flavor it, then add the mixture to softened gelatin, pour into molds and chill. They’ll be ready to eat in two to four hours, but you can make them a couple of days in advance as well (for those weeknight sugar cravings). The creaminess of panna cotta practically screams to be paired with fruit (if a milk pudding could scream — it seems too mild-mannered for that), and this time of year, rhubarb provides the perfect foil. I have a soft spot for rhubarb – it used to grow in my great grandmother’s garden when I was a child – and prefer it in a simple compote, just cooked with some sugar and a touch of vanilla. If you can’t find rhubarb fresh, I’ve had good luck with the frozen product I’ve found at Whole Foods. The nice thing about this dessert is that it’s so easy, you’ll have time to both cook it this weekend and spend time in the garden, or at the beach, or curled up with a good book. 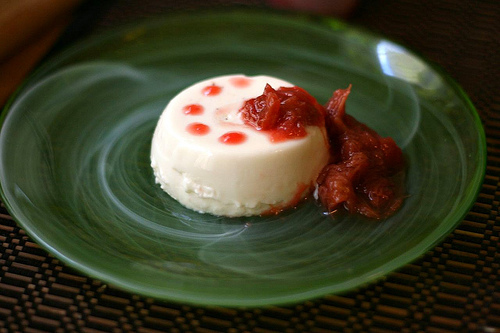 Only you’ll have some sweet and creamy panna cotta to keep you company. Toast the almonds until golden brown, and roughly chop. Heat the cream, sugar and almonds in a saucepan until the sugar is dissolved. Remove from heat, and let sit for 30 minutes. Pour through a fine mesh strainer lined with a dishcloth, reserve liquid and discard almonds. Rewarm liquid, add almond extract. Lightly oil four custard cups with a neutral oil. Sprinkle the gelatin over the cold water in a medium bowl and let stand 5 to 10 minutes. Add gelatin to warm cream mixture, and stir until gelatin is completely dissolved. Divide among custard cups, and chill at least 2 hours or until firm. Run a sharp knife around the edge of the cup to unmold. Serve with rhubarb compote. Combine all ingredients in small saucepan. Cook over low heat, stirring frequently, until the rhubarb has broken down and the mixture is the texture of chunky applesauce. Chill. “Milk pudding?” As in made from or flavored? Is “panna cotta” scary? Isn’t it just bread pudding? “Blancmange” always seemed to me to mean eating “white goo that hasn’t quite become cheese yet?” Ah, semantics? Anyway, I’m sure it tastes wonderful. P.P.S. This message not sent via facebook! M — Milk pudding as in made from. Panna Cotta — actually Italian for “cooked cream” (not Pane Cotta) and it can seem intimidating if you’ve only seen it in restaurants. Gorgeous! A fabulous idea. Thank you. What gives your recipe the “toasted” taste? Is it the extract or the almonds themselves? Mrslimestone — toasting the almonds gives it the toasted taste, and the almond extract boosts the flavor.